What makes a play compelling theater — engaging the audience with a great story, or amazing them with clever stagecraft? Call me old-fashioned, but I’m more captivated by the well-told tale. Great storytelling is not at the heart of British playwright Neil Bartlett’s 2004 adaptation of Charles Dickens’ Oliver Twist. Dickens (1812-70) created some of the most memorable fiction since cavemen first spun fireside yarns about the Big Woolly Mammoth That Got Away. There’s a reason the English novelist’s work has never gone out of print: He gave good story. Victorian-inspired visual, stylistic and musical elements brim from Bartlett’s dark version, a play with live music and several sung choruses. But, by making the hero a hapless victim and betraying the ending halfway through Act I, Bartlett dissipates some of the dramatic tension. That said, Vermont Stage Company’s current production of this Twist still entertains: It showcases mesmerizing performances by outstanding local actors — many of them making their VSC debuts — in an imaginatively rendered world. Dickens was just 25 when he created the plucky orphan protagonist of Oliver Twist; or, The Parish Boy’s Progress. What we now read as a novel originally came out in monthly installments, from February 1837 to April 1839, in the London magazine Dickens edited, Bentley’s Miscellany. The young author was not far removed from his own painful childhood experience, laboring in a shoe-polish factory while his father languished in debtors’ prison. In 19th-century England, poverty robbed children of childhood. Oliver flees to London and falls into the clutches of Fagin, who controls a gang of pickpockets and thieves. Others vie to save or exploit the boy as he tries to survive the big city’s bewildering streets, from Fagin’s criminal associate Bill Sikes and sassy streetwalker Nancy to the genteel Mr. Brownlow and his daughter, Rose. Will the child ever overcome the circumstances of his birth? Inexplicably, playwright Barnett makes Oliver nearly a nonentity in his own story. Like fellow foundling David Copperfield, Twist remains an unforgettable Dickensian character because he becomes the unlikely hero of his own life. Barnett portrays him as a mere pawn, giving the actor brief, simpering “please-don’t-hurt-me” lines. In the Vermont Stage production, director Jason Jacobs doesn’t bolster the passive, underwritten part — played by sweet-faced Libby Belitsos, 11 — with much action or expression. The adults in the ensemble, however, dive into their roles with relish. Most play multiple parts. Kevin Christopher is the most impressive chameleon. A hollow-eyed, hunger-stricken orphan hunched over his gruel becomes the supercilious Mrs. Sowerberry, buxom bosom heaving as she pontificates on Oliver’s iniquities. A few scenes later, Christopher morphs into a marvelous magistrate, guilty of gavel banging while inebriated. Jordan Gullikson, as Bill Sikes, and Chris Caswell, as Nancy, give nuanced, spellbinding performances. Gullikson conveys menacing, soulless villainy with “two scowling eyes,” just as Dickens describes. Caswell captures Nancy’s feistiness, flashing anger, determination and cunning as she navigates her desperate world. Concern softens her demeanor when she tries to ensure Oliver’s safety, especially in scenes with Rose Brownlow, elegantly portrayed by Taryn Noelle. The women interact movingly as their characters cope with a giant class divide. Fagin is the star of Bartlett’s script. Rather than show the criminal’s progression from evil to madness, however, Ethan T. Bowen’s portrait starts at crazy and creepy and stays there. Bowen does bonkers brilliantly, but the repetitiveness of Fagin’s ramblings makes the lunacy eventually lag. 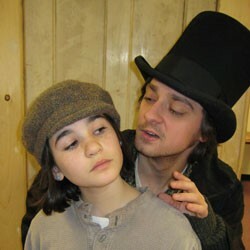 As the Artful Dodger, however, New York actor Robby Tann quickens the pace: He’s sharp, sly and always in the know. Jenny C. Fulton’s scenic and costume design envelops Oliver’s characters in gorgeously rendered visual elements. Distressed woods, cast-off possessions and a grimy palette of drab neutrals surround the orphans and criminals, while the wealthy inhabit a shiny, color-filled world. John B. Forbes uses stark lighting effects to emphasize these contrasts. Particularly effective is eerie uplighting that mimics 19th-century gas foot lamps. Quirky incidental music and sound effects, performed live, work wonderfully to heighten the production’s stylized, Victorian feel. Burlington musician David Symons, who composed the score, plays accordion; Emma Gonyeau plays violin. (Both also use other instruments, often quite innovatively, from piano to school bell.) The sung numbers are somewhat less successful. Symons’ musical writing is fine, but Bartlett inserts most of the choruses without checking his playwright’s “why do my characters sing here?” meter. The songs interrupt, rather than advance, the story. How Victorians consumed Dickens’ work explains, in part, his mastery of storytelling. Suspenseful plotting and unforgettable characters left readers eagerly awaiting the next installment. When it came out, families gathered in the parlor and listened while one person read aloud Dickens’ lively prose. Staid Victorian drawing rooms became vivid playhouses of imagination. Today, our closest communal experience to this is live theater, for which Vermont is blessed with a deep pool of local talent. It’s best when they can start with a really good story.